Rowena Beaumont Cert.Ed., Trainer, Trainer of Trainers, Expert EFT Practitioner, Healer/Energy Balancer, Pioneer and Researcher. Rowena has spent many years discovering methods to support people clearing their past negative programming, blockages, limitation, emotional and physical pain and to compassionately support them on their Soul’s journey. She specialises in Emotional Freedom Techniques (EFT), Emotional Freedom ‘Light’ Techniques and Matrix Re-imprinting as well as often combining this with Regenerative Healing which has been proven to be highly effective. Emotional Freedom ‘Light’ Techniques was designed as an extension of EFT adding a new dimension and greater depth to traditional EFT. Rowena is considered an Expert EFT Practitioner and is an AAMET International Accredited Certified EFT Trainer of Trainers. She was introduced to Dr Rosy Daniel, a holistic doctor in Bath in 2011 and soon after was asked to become the Spiritual Director of her Regenerative Health Team and has been working alongside her ever since supporting clients with cancer and serious illness. "Patients almost always experience high levels of fear, anxiety and depression in connection with their diagnosis, treatment and prognosis. The provision of Rowena’s therapeutic help pre, during and after treatment allows patients to embrace their treatments in a far more positive way and to re-engage properly with life again once treatment is over. I would recommend her services." Rowena has Pioneered EFT since 2002, has been running EFT Training Courses from that time and has also worked with over 1,800 clients. 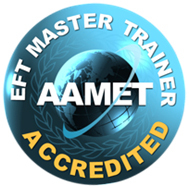 Accredited & Certified as an AAMET International EFT Master Trainer of Trainers June 2014. 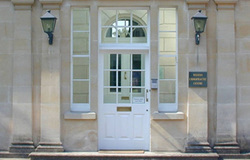 Trained as Health Creation Coach and Mentor with Dr Rosy Daniel at Health Creation Bath and Bath Spa University 2012 -2014. Attended the Golden Path program facilitated by Dr Rosy Daniel and the late Pat Pilkington co-founder of the Penny Brohn Cancer Centre, Bristol. Trainer/Practitioner of Emotional Freedom Techniques (EFT) 2002 – 2016. Trained at Level 3 with Tam Llewelllyn-Edwards PhD and became an AAMET Certificated Trainer of Trainers April 2009. Trained with EFT Master Karl Dawson in Matrix Reimprinting in 2010. Studied extensively and trained in different healing/energy balancing modalities 1996 – 2016 which included: Magnified Healing, Magnified Healing ‘Light’, Holographic Healing, Electromagnetic Field Balancing (EMF), Energy Interference Patterning of DNA (EIP) with Margaret Ruby (USA), Divine Healing Master Key with Dr Alhmeerah Ariel Hallaire (UK) and Soul Contract Readings with Nicolas David Ngan. Trained with co-originator of Magnified Healing Gisele King in Miami Florida 2001 and became the first Magnified Healing ‘Light’ Practitioner Master Teacher in the UK. Reviewed Trainers Course with co-originator Gisele King April 2016 Alicante Spain. Facilitated the training of 241 Magnified Healing Master Teachers & Practitioners. Trained as a Reiki Master Practitioner and Teacher in 1996 on the Island of Kauai, Hawaii and as a Karuna Reiki Master in 2004 and Angelic Reiki Master 2007. Facilitated the training of over 700 students and over 100 Reiki Masters/Angelic Masters and Teachers.